Professional Heavy Duty AC Mains operated Counterfeit Detector. 12 watts of UV Light, plus 6 watts of White Light below for checking Water mark and metal/plastic strip. The system that provides the ultimate forgery detection providing peace of mind. Quick, convenient, efficient and easy to use. Detect only one note to realise your investment. Click on guidance images for notes on Forgery detection. Click on the Dual checker image to return to the normal page. Perfect for Professional use to check for Forged Notes- Driving Licences - Birth Certficates and Passports etc. This machine will Automatically Switch itself OFF after about 15 seconds of no use and switch back on immediately something is placed beneath the lamps, thereby saving energy. It also now includes a Magnifying Lens built in to the top of the Cowling to enable the checking of Micro Printing and Watermarks. Now includes a Magnetic Ink Reader for checking Euro Notes. Our forged note detectors are designed to offer users a simple, quick and easy way to check for counterfeit and forged documents banknotes and credit cards. The Document/Banknote or Credit card issuing authorities are the only people who can 100% confirm if a Document/Banknote or Credit card is genuine or not. Some police laboratories can provide an intermediate service, but it is advisable to refer the document or banknote to the issuing authority. FORGED NOTE DETECTORS: using a U.V. (ultra violet) and white light together is an aid to prevention and to stem the increasing number of forgeries. Users of the U.V. Forged Note Detectors must check for the continuous metallic/plastic strip, watermark, the feel of the paper and the amount of U.V. reflection should be checked. 1. U.V. LIGHT: A genuine bank note should not fluoresce right across the banknote. Many banknotes have fluorescent marking in the note. When they are held under the U.V. light the marking will appear (only the design should fluoresce when passed under the U.V. light). 2. FEEL THE PAPER: Some forgers have soaked the forged notes in U.V. protection fluids such as sun tan lotion thus supposedly blocking out the U.V. light. However, sun tan lotion and such like are not 100% U.V. proof. 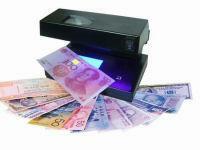 The banknote will still fluoresce slightly as well as feel greasy to the touch and look very fragile. If you try to block the U.V. you also block the watermark. 3. WATERMARKS: Many counterfeit watermarks are bleached into the paper. A U.V. light will not fluoresce a genuine watermark, but will fluoresce a bleached watermark. Only a white light will display the watermark. The Dual Checker Counterfit Detection Lamp is ideal for this purpose. 4. METAL AND PLASTIC STRIPS: Under a white light, a continuous metal strip can be seen. A genuine banknote will reveal a continuous strip as it is sandwiched in the genuine banknote. With a forgery you can usually see a dashed line where it is painted on the outside of the note. If a magnifying lens is used, in many currencies the value of the note is printed onto the strip. 5. EUROS: In addition to the above security, there is micro printing that can only be seen under 10 x magnification. 6. CREDIT/DEBIT CARDS: (fluorescent design) MASTER CARD has ‘M’ ‘C’. AMERICAN EXPRESS has ‘AMEX’. VISA has the Eagle design. SWITCH has the switch logo. VISA DELTA has the Eagle design. Check the security number printed in black on the back of the card. 7. DOCUMENTS: Newer Driving Licences/I.D. Cards/Passports have fluorescent designs on them. 8. BANK CHEQUES: All of the major banks now print fluorescent designs into their cheques. 9. EURO NOTES: All of the new Euro notes have fluorescent markings on the back of them. Forged Note Detectors are only a front line aid to he prevention of forged and counterfeit banknotes, documents, credit cards and cheques being passed as genuine. 1. Unplug the unit from the AC mains supply. 4. Put the covers back into place. 5. If you have any doubts please use a qualified electrician only. 1. The units must be placed at a height that will NOT allow anybody to look directly at the U.V. bulb. If this is not possible, then the U.V. lamp must be between 30/40cm away from the eyes. 2. It is recommended that the operator does not expose their hands under the U.V. light for more than 90 minutes on a continuous basis.